Now here's a scoop as Jamie Edmiston of Edmiston & Company calls to say that he and Nicholas Edmiston, along with Merle Wood and Peter Croke of Merle Wood & Associates, are now joint central agents for the sale of Oceanco's 82m superyacht Alfa Nero. The contract was originally signed with the owner by Peter and Merle who then appointed Jamie and Nicholas as joint centrals. Launched in 2007 and boasting a host of innovative features including - my favourite - an infinity pool on the main deck that converts to a heli-pad, she accommodates 12 guests in a master, two VIPs and three doubles plus 14 double cabins for 26 crew. Alfa Nero was ranked #43 in Boat International's list of the world's 200 largest yachts in February 2009 and is Lloyds classed and MCA compliant. I was fortunate enough to be given a tour aboard soon after her delivery and the overwhelming impression was, well, overwhelming. 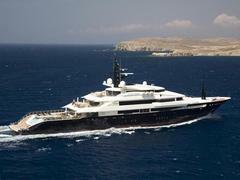 Alfa Nero is asking €129.75 million and will be anchored off Monaco during the Monaco Yacht Show.